Different quality and design tower fans are now available in online and market. But few of the top-notch brands among them succeeded to win the trust of the real consumer. 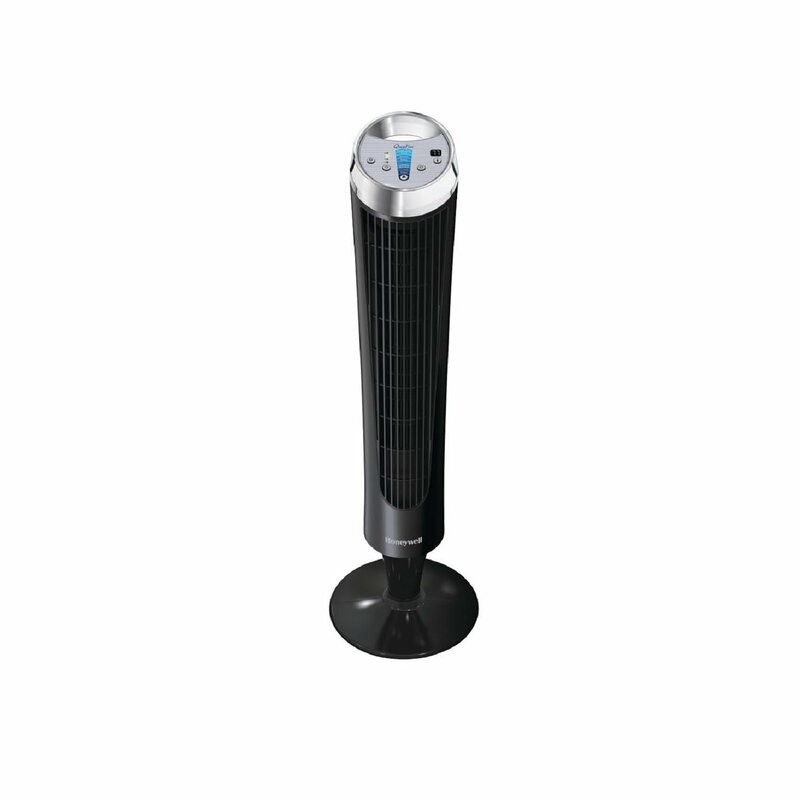 Honeywell is one of the most popular that produce good quality tower fan. Honeywell HY-280 Quietset whole room tower fan is one of their best product which got many 5 star reviews in top e-commerce sites like Amazon, eBay, and Walmart. It is a great blend of functionality with an attractive design. New added functionality features is something that makes this product more desirable than other tower fans. Let’s take a look at some of its features to make a better judgment about the product. The oscillating setting can be used when you needed. Digital display on the top of the tower fan. Auto shut off timer at 1, 2, 4 & 8 hours. The design of Honeywell Quiet set whole room tower fan is nearly parallel to the products available in this range. A basic plus is that unlike other fans, it comes with remote control. The color combination used is attractive. The metallic silver top panel with the black frame goes well with any interior pattern. Its lightweight makes it quite convenient to carry it from one corner of your house to other according to your requirements. It will blend in quite well with the office environment due to its color variants and simple sleek design. It seems perfect for use at an office as well as home. The control panel is built well and is user-friendly (easy to operate). It is easy to assemble and install too. You will not require the assistance of an expert to fix it up. This Honeywell fan is very easy to clean and it will definitely save your money and time. The base of Honeywell HY-280 can be assembled effortlessly. Honeywell HY-280 adheres to most of its claims. As the name suggests, the tower fan is quiet in operation. Notwithstanding, there are some complaints (though very few) of noise at highest speed. The tower fan has got eight speeds instead of three speeds that we normally find in tower fans belonging to this category, which is a significant plus. The oscillation and breeze settings work significantly well. The fan can be set according to customer preferences from “Sleep” to “Power Cool” mode. A thermostat has been introduced into the design which will help you maintain the room temperature at a desired value. The tower fan will automatically turn off or on when the room temperature changes. There is a timer on the fan which helps you set a particular time after which it will turn off. The maximum time span available is eight hours, which is sufficient. But one notable drawback is that there is no previous setting storage on the fan. That means if the fan gets off once, you will have to make the settings according to you again. The remote controller works perfectly and is an addition to your convenience. The control panel is designed well but the panel light i.e. the LEDs are slightly bright. They tend to emit a piercing blue light which is a little annoying, particularly if you get disturbed by lights during sleep. There is also a complaint about the panel buttons getting difficult to use after repeated use. Honeywell HY-280 is a user-friendly fan except for the bright LEDs when it is dark. It is quiet in operation for most of its speed. The timer and thermostat enhance overall product quality. It keeps the users less bothered about the room temperature. The design is good and the fan goes well with any surrounding. All the components are made of high-quality materials.The motor is smooth and quiet in operation. The fan is designed to work for a long time, but some of its parts tend to fail after repeated use.The control panel is one of the sections that get damaged in the long run. The LEDs and on/off button does not work after prolonged use. The remote controller is an alternative, but the control panel to an extent does not match the quality of other parts in the product. One of the best achievements in product design is the little noise. The fan is extremely quiet in operation. So there is the least probability of your work or sleep getting interrupted due to the noise factor. The noise rises slightly at the highest speed, but overall it is much quiet in comparison to other fans of the same category. Honeywell tower fan stands true to almost all of its claims. The fan is quiet in operation; helps maintain the room temperature using the thermostat and the timer. It can be made to oscillate or come to a standstill accordingly. The fan is powerful and can be used for medium to large sized rooms. It has got eight-speed, and the different modes available on the panel helps a lot. An outstanding multi-functional fan. You can use it as a fan, exhaust fan or air ionizer. It took very little time to put the parts together. More speed setting options than other Honeywell tower fan models. Blows the air like a champ. This Honeywell tower fan is pet-friendly. Bottom of the fan looks very cheap. What is the function of the thermostat in this tower fan? Answer: Thermostat work as a temperature sensor. It senses the temperature of the room air. If the temperature of the room is greater than the temperature set in thermostat, the fan will automatically turn ON. Otherwise, it will remain to turn OFF. You have to set the temperature thermostat manually. In the display of fan will show the temperature set on the thermostat. How long is the power cord for this fan? Answer: The length is between 5-6 feets, and this length is enough for you. Are there any lights available for the fan? Answer: No. This fan doesn’t have any lights. Does this fan come with air ionizer? Answer: This model of Honeywell tower fan doesn’t have air ionizer. What is the battery size of the remote control? Answer: This fan needs two AA size battery for remote control. Honeywell HY-280 Quietset whole room tower fan is one of the best products available in the price range. When compared to other tower fans in the same range it has got the upper hand in product quality and functionalities. If you are planning to buy a tower fan, you can definitely go for it.